Welcome and thanks for visiting our page. Dental Aid Network (DAN), is a charitable organisation founded by four Glasgow based dentists with the aim of providing dental care, oral surgery and disease prevention to those who have no access to it. 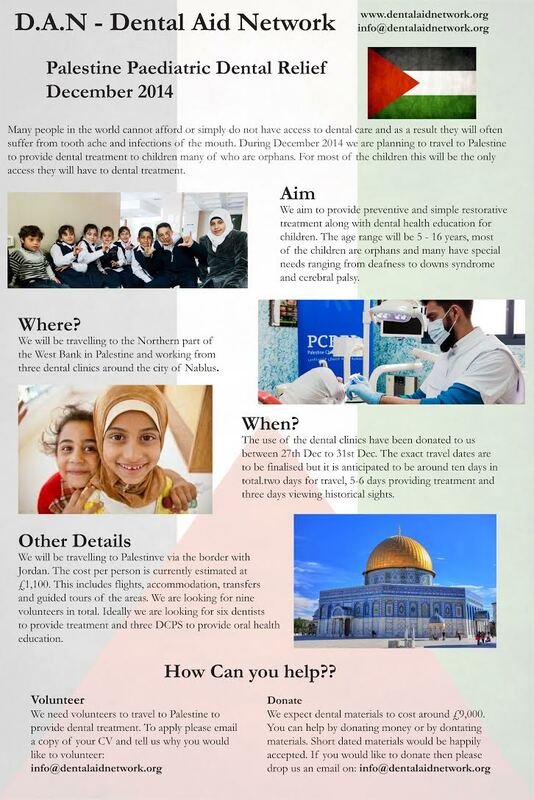 On 22nd December this year a group of ten 10 DAN dentists will be travelling to Palestine to provide care for two orphanages and a special needs school. We hope to achieve dental fitness for every child before we leave, no matter what it takes. We have had very generous support from companies and individuals alike. Our long term aim will be to establish and fund a fully equipped clinic in Nablus where DAN dentists will be able to work all year round. Keep visiting, keep supporting us. We are counting on it.